Chronopolitics curated by Florence Derieux, the 2017 IN/SITU program explores the idea of time in various ways. Evoking terms such as immediacy, instantaneity, simultaneity, ubiquity, imminence, permanence, impermanence, chance, probability, memory, remembrance, these artists’ works question the temporal conditions, or episodes, that disturb our traditionally linear understanding of time and progress. In doing so, they allow us to experiment, evaluate, imagine, and reimagine our own relation to the real. This presentation by Bethany Collins consists of two separate works presented in dialogue, America: A Hymnal, 2017 and The Birmingham News, 1963, 2017. The title piece America: A Hymnal is made up of 100 versions of My Country ‘Tis of Thee from the 18th-20th c. While the differing lyrics remain legible, the hymnal’s unifying tune has been burned and etched away. Bound and executed in the likeness of a shape note hymnal, in its many lyrical variations, America: A Hymnal is a chronological retelling of American history, politics and culture through one song. Written by the Rev. Samuel F. Smith in 1831, My Country ’Tis of Thee (also known as America) debuted on July 4, 1831 by a children’s choir at the Park Street Church in Boston, Massachusetts. Long before Smith’s lyrics were sung aloud, the tune for America served as the national anthem for at least six other countries, including the United Kingdom’s God Save the Queen. And since Smith’s writing, the lyrics of My Country ’Tis of Thee have been re-titled and re-written at least one hundred hundred times. Collin’s The Birmingham News, 1963, 2017, is a grouping of blind-embossed prints on newsprint of select interior pages from The Birmingham News archives from the year of 1963. The prints have undergone a series of multiple pressings, resulting in their final incarnation, a state of deteriorated fragmentation. Selected pages mark key moments in the 1963 Birmingham Campaign, a series of organized actions aimed at dismantling segregationist policies in one of the most racially divided cities in the US. While widely publicized by news outlets nationwide, violence against those involved in the Civil Rights Movement went largely unreported by the local Birmingham News, a conscious decision by the paper’s editorial board, ironically made out of fear of inciting violence. Select front-pages in Collins’ series showcase the alternative news items chosen to representative of the days’ events, instead of each day’s protests, demonstrations and counteractions. This particular presentation focuses on the paper’s interior pages where the minimal coverage was buried. What is left in the archives is a blind eye towards the complete story of these days in history, a selective decision to focus on alternative events that leave the narrative incomplete. 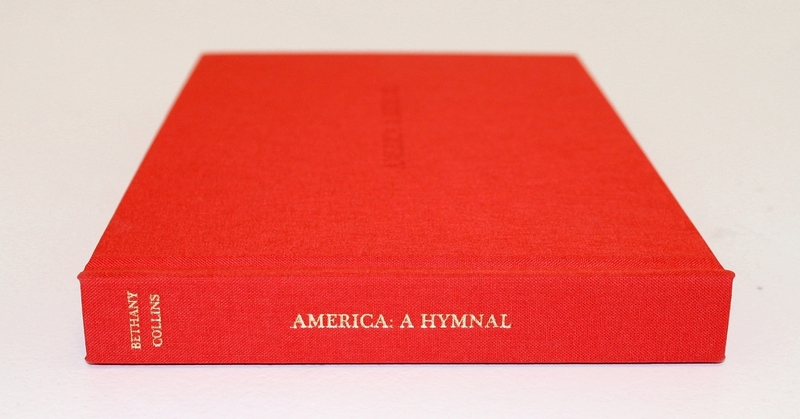 America: A Hymnal is the first edition in a series of collaborations between PATRON and Candor Arts. This collaboration between PATRON artists and Candor Arts aims to create a series of art books that expand on the artists’ practices through an approachable and attainable art object. Through the intimate and powerful engagement of artist books each artist will create a unique and special limited edition. Bethany Collins(Artist, PATRON, Chicago),Lavar Munroe(Artist, Jenkins Johnson Gallery, San Francisco), and Dan Peterman(Artist, Rhona Hoffman Gallery, Chicago). Moderated byFlorence Derieux (2017 IN/SITU Curator). BETHANY COLLINS (b. 1984 Montgomery, AL) lives and works in Chicago, IL. Collins received an MFA from Georgia State University in Atlanta Georgia, a BFA from the University of Alabama in Tuscaloosa, AL and attended the Glasgow School of Art, Capstone International in Glasgow, Scotland. Recent solo exhibitions includeAnother Country, Eli and Edythe Broad Art Museum, Michigan State University, MI;Gray Matters: Art en grisaille, Wexner Center for the Arts, Columbus, Ohio;Eye of the Beholder , Tarble Arts Center, Charleston IL;Beyond Boundaries, Pennsylvania Academy of the Fine Arts, Philadelphia;Excerpt, Studio Museum in Harlem, New York NY;In Evidence, Van Every/ Smith Galleries, Davidson College, Davidson, North Carolina; The problem we all live with, Birmingham Museum of Art, Birmingham, AL; with the exception of the sky, Hudgens Center for the Arts, Duluth, Georgia, and Inquiry’s End, Richard Gray Gallery, Chicago, IL. Her work is included in the public collections of the Birmingham Museum of Art, Birmingham, AL; High Museum of Art, Atlanta , GA; Montgomery Museum of Arts, Montgomery, AL; The Studio Museum in Harlem, New York, NY; Zuckerman Museum of Art at the Kennesaw Stats University, Kennesaw, GA; Pennsylvania Academy of Fine Arts, Montgomery, AL; and the Agnes Scott College, Decatur, GA.